This past Spring, a new collection of short stories complied by Carolyn Strom Collins and the late Christy Woster was published by Nimbus Press. The LMMI has this exclusive look at how the collection came to be. Welcome, Carolyn! 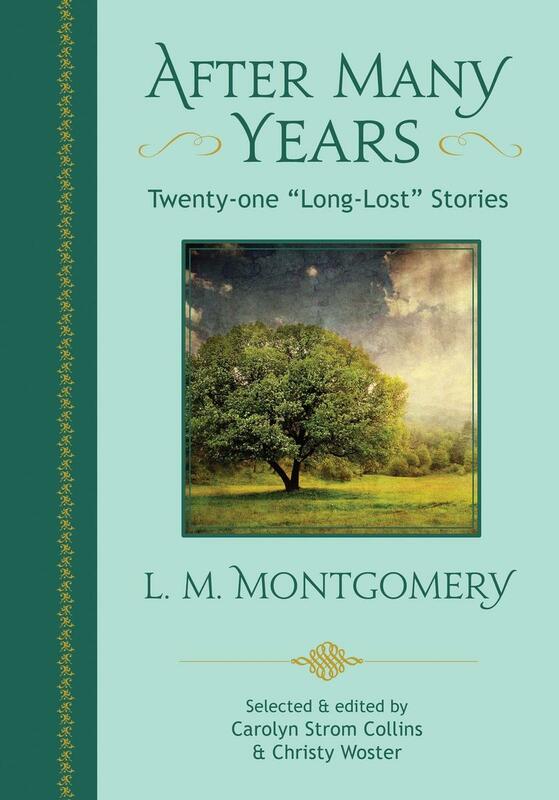 After Many Years: Twenty-One “Long-Lost” Stories by L. M. Montgomery is the result of many years searching through hundreds of magazines and newspapers in the dusty stacks of libraries (as well as, more recently, the internet) for Montgomery stories known to exist but with no information on when or where they were first published. Some of those stories had been published in Chronicles of Avonlea and Further Chronicles of Avonlea during Montgomery’s lifetime; others were published later in volumes entitled The Road to Yesterday (published in 2009 in its entirety as The Blythes are Quoted) and The Doctor’s Sweetheart. In the 1990s, Rea Wilmshurst edited and published more of the stories in themed volumes (Akin to Anne, After Many Days, Across the Miles, Along the Shore, Against the Odds, Among the Shadows, At the Altar, and Christmas with Anne). Altogether, these collections contain about only about half of Montgomery’s published stories. Wilmshurst had searched for the sources of Montgomery’s stories and poems after discovering the scrapbooks in the 1970s. She published her findings as part of Lucy Maud Montgomery: A Preliminary Bibliography in 1986. In the bibliography of stories, there is a section entitled “Unverified Ledger Titles” that lists sixty-four story titles that Wilmshurst had not been able to find in her search. These titles intrigued a group of Montgomery “sleuths,” and, working independently over the last thirty years, they managed to locate a number of these stories. Some of the stories had been used as chapters in Montgomery’s novels such as Magic for Marigold and Anne of Ingleside; some were entirely new. The “sleuths” sent their findings to me to add to the updated bibliography of Montgomery’s stories and poems I was working on (this was published in 2016 by the L. M. Montgomery Institute at the University of Prince Edward Island). Christy and I wanted to publish the titles in chronological order so that readers could see how Montgomery’s style developed over the years, in this case from 1900 – 1939. Seven of these twenty-one “long-lost” stories were published before Montgomery’s first and best-known novel, Anne of Green Gables, was published in 1908. Like many of Montgomery’s earliest stories, most of these featured school-aged children as the main characters. After Anne of Green Gables, Anne of Avonlea, and Kilmeny of the Orchard were published, Montgomery changed her focus somewhat from writing about children and began to write more stories with adult characters and situations. After each of the stories in this collection, a note on its publication history and those who located it (and shared their discovery with us) is included, along with a bit about Montgomery’s own story taking place at the time the story was published. We also note when a copy of the original story appears in the on-line Ryrie-Campbell periodical collection, Kindred Spaces. Another Montgomery story – “In the Home of Her Mother” – was found too late to be included in After Many Years but it was published in the 2016 edition of The Shining Scroll, the on-line newsletter of the L. M. Montgomery Literary Society. Sadly, my co-editor Christy Woster died suddenly and unexpectedly a month before this volume of stories was first published. She would have loved to have seen her name on the cover, one of her most-hoped-for life goals. She would have also continued the search for the remaining three dozen or so “unverified” story titles. Christy and I agreed early on that proceeds from the sale of this collection would be donated directly to the L. M. Montgomery Institute at the University of Prince Edward Island for the purpose of adding to and maintaining its collection of Montgomery artifacts, which are made available for study by Montgomery scholars and researchers all over the world.